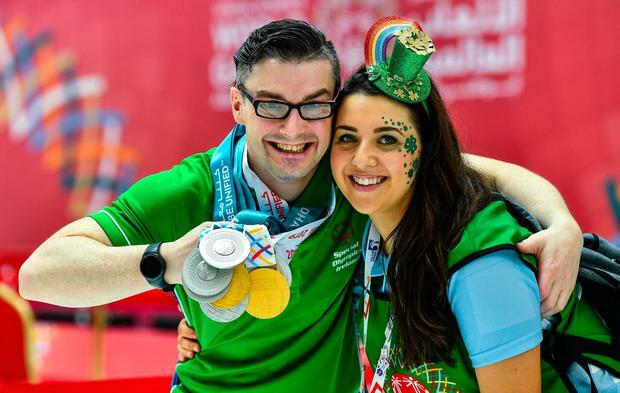 There is a secret to the success of Ireland's Special Olympics athletes and it all lies in focusing the mind - with some of the stars practising tai chi during the interval in their competition. The Chinese martial art has been introduced across the board for Special Olympics Ireland athletes. 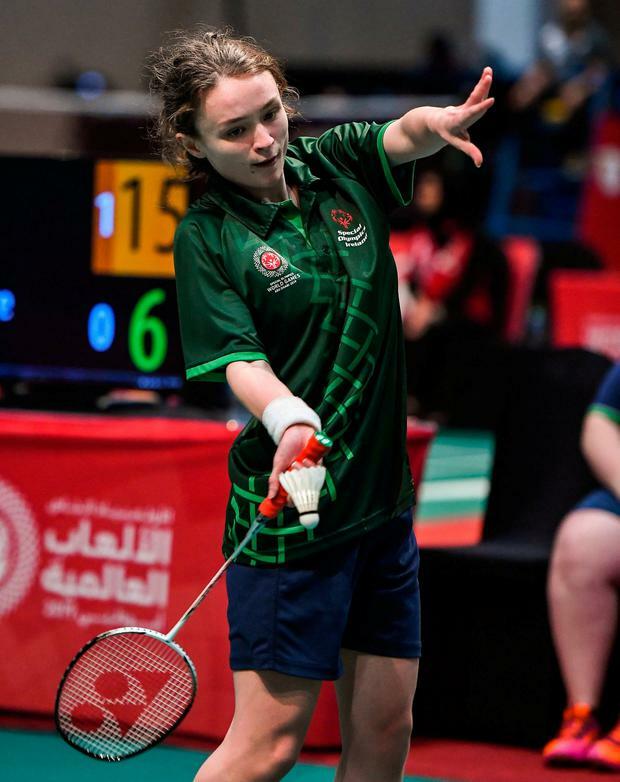 And the benefits were there for all to see in the Adnec Arena, where badminton star Sarah-Louise Rea (19) has been swatting aside all in front of her. The Lisburn athlete made light work of her opponents on St Patrick's Day to leave her mum Sharon Rea almost in tears - until she was given a nudge by her daughter to pull herself together. "No crying," the teenager insisted. Though Sarah-Louise did say the success was all about "making my family proud". During the break between sets, Sarah-Louise could be seen putting the martial art to work with coach Kim McCrave. "Passion comes in both ways, when you're up and when you're so down, so when we're able to refocus her when she's down and get that focus back quick it's essential to her game," her coach explained. The brain behind this operation is Cáit Donnelly, the health and wellbeing co-ordinator with Special Olympics Ireland. "For a lot of our guys, they might have been travelling for the first time on their own without their parents, so just to keep everybody calm and relaxed but also for the coaches as well, so they are calm and relaxed and they feel good," she said. "Because people with an intellectual disability are so much more in tune with their emotions than we will ever be, they find tai chi very easy to use and get huge benefits out of it." And while the medals continued to roll in on day three of competition, so did support for Team Ireland - in particular from the locals. 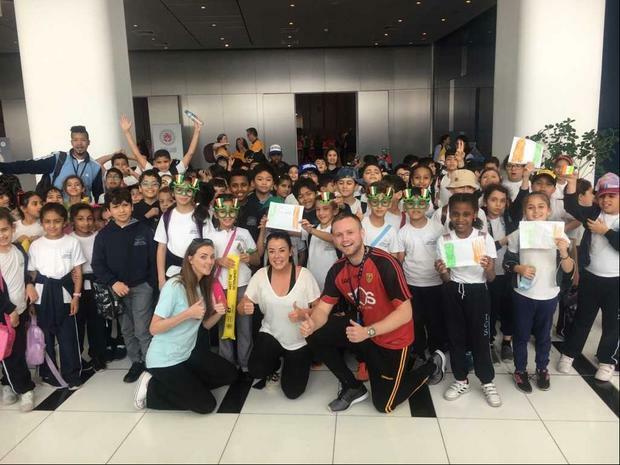 Irish teachers James Balmer, Caoimhe Nig Aoife and Lisa Quinn Kilcoyne brought hundreds of their pupils from International Community School Abu Dhabi on a St Patrick's Day field trip and taught them some Irish chants along the way. "Go east, go west, Ireland is the best" and "Team Ireland" were chanted by the Emirati children as they watched their adopted nation in basketball. A rake of medals flooded in for the team in artistic gymnastics, with Laura Rumball from Dún Laoghaire, Kellie O'Donnell from Carrick-on-Suir in Tipperary and Lisa Redmond all among the big winners. Laura (22) - with two silver medals draped around her neck - said it was "fabulous". Ryan Nugent Nerves and excitement filled Dublin Airport as Team Ireland's Special Olympics squad jetted off to the World Games in Abu Dhabi.